Have spent a couple evenings on getting GRBL up and running now. Here's my notes from setting it up. At Oslo Maker Faire, I finally met Simen Svale Skogsrud from the Oslo firm Bengler. One of their/his many cool side-projects is GRBL - a machine control software used for CNC, laser and 3D printers. 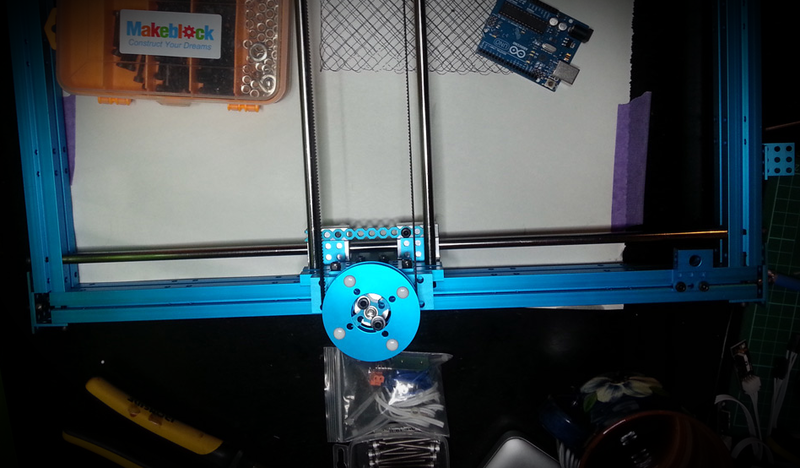 As soon as I saw the Makeblock X/Y gantry, I knew that I had to make it run GRBL. Since most of the guides available seem to think that getting GRBL onto an Arduino is difficult, I thought that I'd write a small guide/tutorial for how I did this. Start by copying / clone the source files from the Github repository to your machine. The precompiled versions could work, but I'll need access to the source later. If you don't have the Arduino IDE installed, go get it from arduino.cc. This contains all the command line tools we'll need, including avrdude (used for uploading code to the Arduino) and the avr-gcc compiler (converts source code to something the Arduino can use). The Terminal application is in the Utilities subfolder on your Mac /Applications/Utilities/Terminal. Open the app and type avrdude. If you get an error message along the lines of "command not found", we will need to setup the Mac to know where the AVR software are. My original intent was to use LadyAda's tutorial (http://www.ladyada.net/learn/avr/setup-mac.html) for setting up AVR, but it's unfortunately quite outdated. Some of the external links are dead and I think it's possible to do this a little easier given that all the required tools are in the Arduino download. After adding to the path, you'll need to close that terminal window and open a new one for the PATH to refresh. Typing "avrdude" in this new terminal window should now list all the options instead of "command not found". If not, go back to the tutorial above and try again. To generate a .HEX file from the source code, simply type "make" and hit Enter. If all goes well, you will now get a compiled program that you can upload to your Arduino. If something goes wrong, type "make clean" to remove the generated files. To see what other options are available, have a look at the "makefile" in the grbl folder. this is also where you'll adjust the compilation options if you're compiling for something other than an Arduino UNO (or other Atmega 328p-based devices). avrdude: error reading system wide configuration file "/usr/local/etc/avrdude.conf"
sudo find / -name "avrdude.conf"
This returns a list of possible devices and it's the same you'll find in the Arduino IDE. In my case it was /dev/cu.usbmodem411. Note: do not have the Arduino IDE open while doing this as it can cause trouble. Note the addition of -carduino at the end there? It helps with defining the right board. Ohhh! It's uploading! Now let's see if this works. We should be able to log onto the GRBL installation using the Arduino serial monitor. Bingo. For figuring out the rest, I looked a lot at this tutorial that details how to use GRBL for a laser engraver. It's a little outdated, but has tons of good info!